Brant Gardner, an LDS intellectual with extensive Mesoamerican knowledge, has a great article at FAIRLDS.org from 2003: "A Social History of the Early Nephites." He finds abundant internal evidence in the Book of Mormon pointing to contact with other cultures in Mesoamerica when the Nephites came onto the scene. In addition to the interesting implications this has for the topic of DNA and the Book of Mormon, it also leads to some fascinating issues pointing to the plausibility of the Book of Mormon as an authentic ancient text from ancient Mesoamerica. For example, Gardner discusses several situations involving political structures (kings, judges) that don't make sense in the context of Joseph Smith's knowledge, but fit remarkably well into what we now know about ancient Mesoamerica. One example is the relationship between Lamanite kings, including the existence of a king over other kings. It doesn't fit a Eurocentric model, but is perfectly at home in ancient Mesoamerica. Kim Siever has a good article on the epithet "cult" that is so often used to scare people away from the Latter-day Saints. See "Is Mormonism a Cult?" (I've also got an LDSFAQ article dealing with the claim that we are a cult). On the FAIRLDS>org Website, John Tvedtnes has an excellent article, "Is God Only a Spirit?" He examines early Christian writings and the Biblical record to show that the LDS understanding of the nature of God is compatible with what John 4:24 actually teaches. Regarding Joseph Smith's use of the KJV text in the translation of the Book of Mormon, and questions that arise due to differences in the Joseph Smith Translation of the New Testament and the related passages in the Book of Mormon, see the FAIRLDS "Ask the Apologist" response to a question about Joseph Smith and Matt. 6:13 by Kevin Barney - an outstanding LDS intellect. I previously posted some information about the Christmas Eve Musical Devotional that has become a tradition in my part of the Midwest. In addition to my photos from 2003, a couple new pics from 2004 are below. The event this year faced the ultimate challenge: with short notice, a Green Bay Packers football game was scheduled at the same time as our devotional. Which worship service would prevail? We feared that the pews might be empty, but again there were nearly 300 people present, just about a dozen less than we had last year. As usual, many non-members and less active members came, putting on the helmet of righteousness and the shoulder pads of faith. 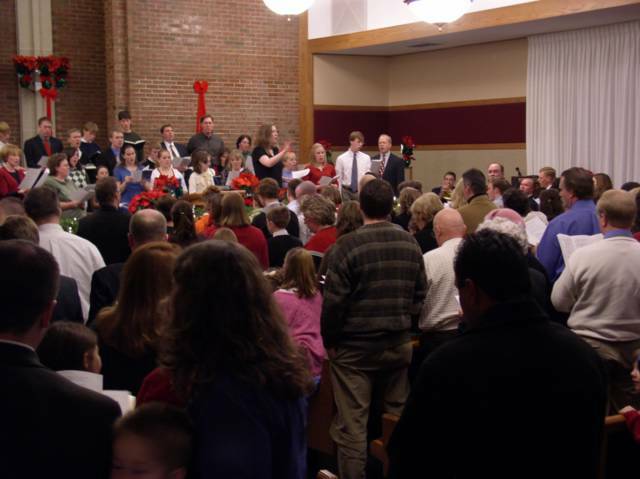 A scene from the 2004 Christmas Eve Devotional in the Appleton Second Ward (Appleton, Wisconsin Stake). 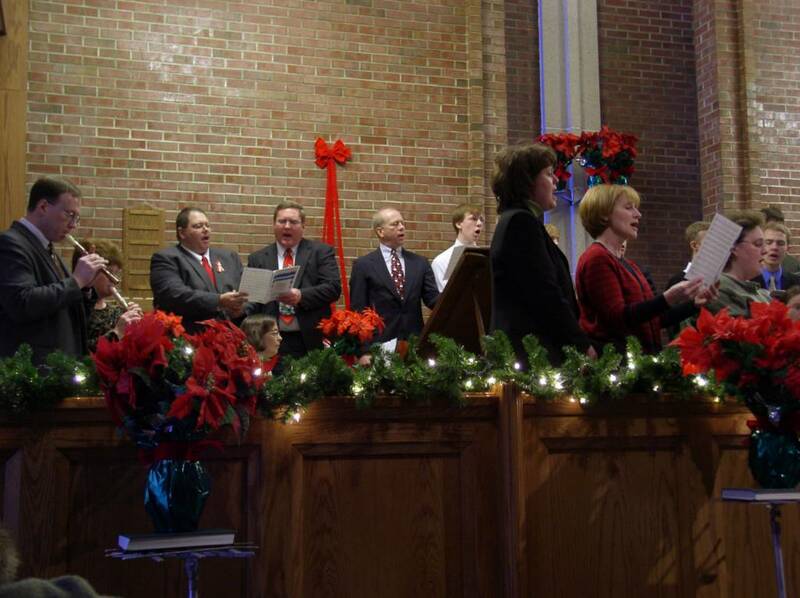 Another view of the 2004 Christmas Eve Devotional. A new volume of one of my favorite publications, the FARMS Review from the Foundation for Ancient Research and Mormon Studies. You need to be a subscriber to gain full access right now, but this volume alone may be well worth the low cost of a subscription. One article that I found especially interesting deals with some of the inaccuracies in recent publications criticizing the Book of Abraham. It's "The Book of Abraham: Ask the Right Questions and Keep On Looking" by Larry Morris, who refutes some popular criticisms and raises a few questions for the critics involving impressive parallels between the Book of Abraham and other ancient texts. Another valuable contribtion comes from John Clark in "Searching for Book of Mormon Lands in Middle America," which evaluates a couple of recently published works offering new proposals for Book of Mormon geography - proposals that fall short of the model that relates the Isthmus of Tehuantepec in southern Mexico with the neck of land. There are 20 entries to read. Enjoy! As I write, I'm watching Larry King interview Gordon B. Hinckley. I'm impressed with President Hinckley's charm and wit, in spite of the toll of age, as he fields a wide variety of questions from Larry King. I also respect President Hinckley's optimism about life and the challenges we face. I was intrigued with what I saw as a frank but gentle and understanding response to questions about working mothers. He's not out to give them a guilt trip, and understands the need for many to work, but wisely reminds us that our greatest satisfaction in life will come from our families, and that there are great blessings to children when they have mothers who are there for them. He urges us to simply "be careful, and do the best we can." His comments on gay marriage had a similar tone: we love our brothers and sisters who struggle with the problem of homosexuality, and want to do all we can to help them. When asked if that problem is something people are born with or choose, President Hinckley said he didn't know, that he's not an expert in such things. The spirit of his remarks was on our desire to help, not to blame or condemn. "We are not anti-gay, but pro-family." Based on my experience in the Church, I fully agree with that. Of course, from the perspective of many in the gay community, to suggest that it is a problem or that homosexual activity is against the commandments of God is vile bigotry and hate, but they are wrong. Overall, a lot of good answers and an interesting program, interspersed with some excellent music from an event with the Mormon Tabernacle Choir. Last week I had an inspiring visit with three nuns, members of the Franciscan Sisters of Charity in Kaukauna, Wisconsin. I went with a good LDS friend of mine whose father, a faithful Catholic, was served by the Sisters of Charity during his last days. My friend makes it a holiday tradition to visit the nuns, partly as an expression of thanks for how they helped his father. These compassionate women minister to the elderly and the terminally ill as they complete their mortal journey. I have met the sisters a few times and have been deeply impressed with their goodness. These are strong, intelligent, and happy women (even jovial) who have sacrificed much to serve others. I salute them, and thank them for the opportunity to talk with them and be uplifted by their goodness and humor (and I really made friends with their dog, Amber). Most Latter-day Saints understand a basic fact of life: we do not have a monopoly on truth, on godly service, on Christian living, nor on divine inspiration. There is much we can learn from our brothers and sisters in many other faiths (that is so basic and obvious, but a few people may need to be reminded). For me, I've found Roman Catholic nuns to provide a relatively rich vein to mine when looking for inspiring examples of saintly character. Of course, I believe that we have much to offer that our fine sisters among the nuns may yet wish to receive - things like the blessings of authorized priesthood ordinances and especially the Temple - but I believe that these blessings will be added to them in the Lord's own time, probably after their mortal missions are completed. As for the rest of us, we need to learn lessons from these good sisters now before it is too late. Merciful, loving service for the sick and the dying is so urgently needed. May we magnify our callings and reach out more to those who suffer and despair. May we focus less on material and carnal pleasure and more on blessing the lives of others and building the kingdom of God. And may we shun selfishness and the vile sins of the world, seeking instead to repent and follow Christ. There is so little time left before our eternity begins. Let us repent now and serve Him. Take that first step now - and rush! Oh, one final suggestion: youth leaders, you might consider taking your young men or young women to visit a convent or another church or religious organization of some kind to broaden their horizons. One of my favorite experiences when I was bishop of my ward was taking the priests one year to visit one of the Kaukauna nuns that I had met at a local interfaith meeting. She gave us a tour of their beautiful church and explained much about her work as a nun and some of the basics of Roman Catholicism. The young men really enjoyed it, and so did Sister Goodman, the fine nun who helped us and treated us so kindly. A Distant Prayer by Joseph Banks and Jerry Borrowman (American Fork, Utah: Covenant Communications, 2001) is a gripping, troubling, and inspiring tale of a Mormon soldier in World War II, Joseph Banks. He was a flight engineer on B-17 bombers who was shot down on his 49th mission (he would have completed his flight duty on his 50th mission). He went through hell, but experienced many miracles as the Lord helped him to endure, survive, and eventually escape. In a sense, his story can be viewed as a model of our own predicament here behind enemy lines in spiritual Babylon, where we must turn to the Lord daily to escape the threats that surround us and flee to Zion. Certainly the Lord could have spared Brother Banks from being shot down in the first place, just as he could place any of us far from whatever challenges he now face - but there is much to be learned and gained by taking whatever trials the Lord allows us to face, and doing all we can to endure to the end in faith. ". . . it took me a few moments to figure out what was going on. . . . I found myself in a tubular section of the fuselage that was open on both ends, spinning in the air as we fell towards the ground four miles below. . . . I was relieved to feel that my parachute was in place, but I couldn't use it because I was stuck against the wall of the fuselage, held there by the centrifugal force. . . . I couldn't get out. I'd try to get up only to be forced back against the wall. In desperation I looked down and saw one of my crewmates lying next to me. I reached out and touched him, but he didn't move. Apparently the explosion had killed him. I knew that I had to muster every ounce of energy I had or I would go down to my death in that section of the aircraft. I tried several times, but to no avail. I was just too weak to pull free, and so the only thing I could do was pray. I asked the Lord to please help me get out somehow. I said it out loud, the words choking in my throat, but He heard me anyway. Suddenly, as clear and as clam as if she was standing right next to me in the living room of our home, I heard the voice of my wife Afton say, "Joe, look down at your legs and you'll see that there's cable holding them. Pull the cable!" That's all she said. I looked around, but couldn't see anyone. Even though I was stunned, I looked down and sure enough there was a cable lying across my legs. I reached down and pulled it with all my might. At first nothing happened, but then I was suddenly sucked out of the fuselage and started freefalling. I later learned that the cable was attached to two pins that held an escape hatch door. When I pulled them loose, the door separated from the fuselage. Talk about incredible. It probably took a second or two for me to get over the shock of being hit by the wind, but then I realized that I was falling backwards through space. And yes, his parachute worked, allowing him to land in enemy territory, where angry villagers surrounded him and probably would have killed him if a couple of German guards - also not especially nice - had not taken him away for interrogation. Things got incredibly tough for Brother Banks - but his example is inspiring. I strongly encourage you to read this book! I was pleased to learn that BYU now provide a variety of free online courses through their distance learning program. These free independent study courses include topics in Family History, Family Life, and Religious Scripture Study, such as the Book of Mormon and the Doctrine and Covenants. There are some pretty specialized topics, such as FHFRA 77 — French Research: Alsace-Lorraine, or FHGER 73 — Germany: Jurisdictions, Gazetteers, and Maps. I signed up for a course myself. Thanks to Walter Reade for bringing this to my attention. A story at WorldNetDaily.com tells of a mom who tried to videotape some of the gay indoctrination efforts at her kid's school - and was thrown out by officials. Parents everywhere need to be aware of the pro-gay agenda that is being pushed in many schools and speak out against this. The gay activists behind this do not want parent interfering with their disorientation. Parents, stay involved! An exclusive interview with Antony Flew is available on the Biola University Website (thanks to Daniel Peterson for pointing out the article). Dr. Flew is the famous British atheist and philosopher who recently accepted belief in God (a theistic view) on the basis of scientific evidence. He is interviewed by Dr. Gary Habermas, a philosopher from Liberty University who has previously debated Flew several times on the existence of God. The discussion is interesting reading and includes such things as Flew's views on C.S. Lewis (he knew him, and while not convinced by Lewis' arguments, found him to be a very reasonable person). The congregation and choir joins in a Christmas hymn, led by Brother Dale Jepson during the Christmas Eve Devotional in 2003. Tracy Price, Natalie Price, and Daniel Lindsay provide beautiful brass accompaniment, joining Ellen Jepson on the organ. A British philosophy professor who has been a leading champion of atheism for more than a half-century has changed his mind. He now believes in God more or less based on scientific evidence, and says so on a video released Thursday. The more I learn about the details of life and the cosmos, the more convinced I am that the scientific evidence is rife with the fingerprints of a supremely intelligent Creator. Even given the existence of such a Being, I am often stunned that it was even possible to find the technical solutions that have been devised to enable life, vision, thought, reproduction, a brain capable of enjoying and producing music, stable stars, planets like earth, and so forth. See, for example, my discussion of alleged design flaws in the Creation. One of the most successful missionary efforts I've seen in my part of the world has been the annual Christmas Eve Musical Devotional sponsored by the Appleton Second Ward in Wisconsin. It's just one hour long, typically from 4 PM to 5 PM, to give families time to be home for the evening. It's not preachy, but emphasizes outstanding musical performances with some short Christ-centered readings interspersed throughout the program. We expect over 300 people to attend each year, including dozens of non-members and less active members from all over the region and members from several wards. 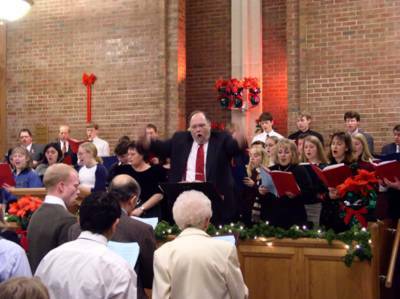 It fills a real need for a worshipful experience on Christmas Eve, and adds tremendous beauty to the occasion. It's become so successful that people clamor for a chance to participate, complicating the heavy task of running this program and keeping it brief. Many thanks to my highly talented friend, Brother Dale Jepson, who was the inspiration for this program and has personally led it to success each year, taking on huge burdens to do so. His leadership has created a success that has touched many people. Indeed, for many it is a spiritual highlight of the year. We found that running a purely optional devotional on Christmas Eve was controversial. Out West, apparently, many LDS people grew up with the notion that the Church should never schedule anything on Christmas Eve because it was sacred family time. That's one of those "unwritten rules" or urban legends that ought to be discarded. As for sacred family time, a few minutes of sharing sacred, uplifting music has proven to be a healthy thing - in fact, a wonderful tradition now - for my family, and I look forward to this year's event again. When I lived out West, I also heard that Christmas Eve was off limits just to have a time when Church leaders could take a break. The way Brother Jepson (with his good family) runs the program, it's almost zero-stress for the leaders (thanks to all his hard work and preparation). The program began when I was Bishop, and I only had to show up and read a simply passage and perhaps add a few improvised remarks. Other leaders and members that don't want to participate are free to stay home. 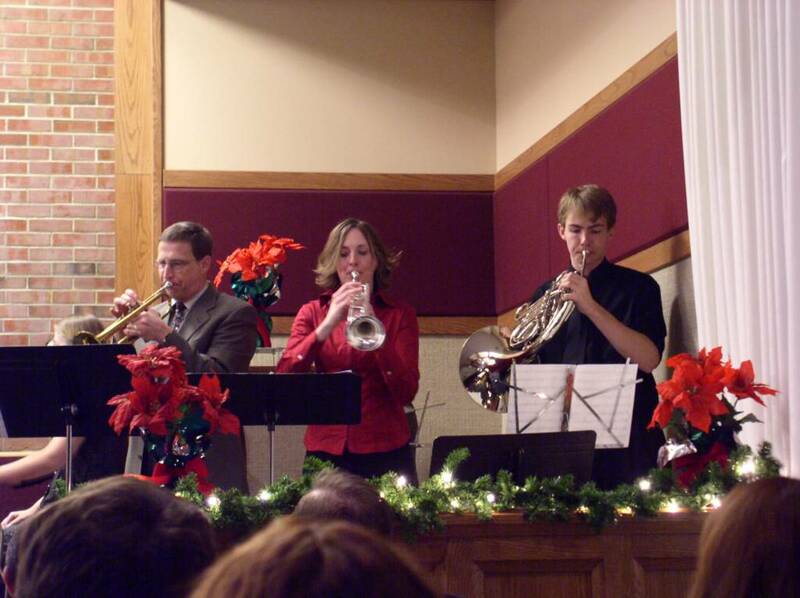 Is the Church doing anything like this on Christmas Eve in your neck of the woods? If not, perhaps it's time to follow our example. Christmas Eve is the ideal time, in my opinion, especially for those who grew up in other churches with a tradition of Christmas Eve worship. But to make it successful, you need someone with a lot of musical experience and taste, a lot of energy, who you can trust to get a difficult job done. Put that person in charge, make the mission clear, give them many months to plan and prepare, and then get out of the way and let the musical miracles occur. If you're interested, I'm sure I can get you in touch with our local experts and pass some program ideas on to you. A comment on my previous post on dreams raises the issue of people who have dreams that suggest doing something unwise (like not joining the Church). Yes, that happens. If I actually did just 10% of the things I've dreamed about, I'd have been locked up long ago. Remember, inspiration given to us in dreams is very similar to inspiration given to our mind and heart when we're awake: we need to filter out random thoughts from the whisperings of the Spirit. Many random thoughts are negative and must be discarded, and many random dreams are the same. So how do we tell the difference? From my experience, learning to hear the voice of the Spirit is somewhat like learning to recognize a new language or new vocabulary words. It's a skill to be cultivated and requires learning. When a prompting comes from the Spirit, in my opinion, there is often an "outside" flavor to it - it's not just me alone thinking that or dreaming that up - and there is a "sureness" or solidity to it that demands attention. Like a logically conjugated verb that we don't yet fully understand, it just seems to fit. And upon further reflection and prayer, it makes sense, though it may require trust and faith. When I've had dreams that I think were inspired, I often awoke sensing that it was a dream to heed, and there have often been positive fruits to heeding them. Other dreams just seem like random dreams and can be ignored (or must be ignored!). Some dreams may seem like ordinary or minor dreams but can provide a perspective or information that can be of surprising help later. For example, one day on my mission in Switzerland, I dreamed that I was in the library looking for information about Indonesia since we had a new investigator from that land. Though only a few seconds long, it felt like a serious dream. A few hours later, we knocked on a door and met a woman who said she was from Indonesia - the first Indonesian I remember meeting. Her husband wasn't home and she didn't seem very interested, but she us to come back later -- something we might not have done but for that dream. We definitely came back - and ended up having many great visits with that family (a Swiss man, his Indonesian wife, and their young child) and had one of the best meals of my life with specialties from Indonesia. They came close to baptism, but did not join the Church, at least not while I was there, but I think the relationship we developed was a blessing to both of us, and I hope the Lord continues to bless those fine people. Of course, it would be insane to heed every dream, so we must learn to filter the rare gems from the normal dross of random mental processes. But perhaps we can learn from even the stray ones or the bad ones. Dreams in which we commit sin, for example, can remind us how fallible we are and how careful we must be. I had an interesting experience yesterday, similar to several other experiences I've had involving dreams. Shortly before I woke up, I had a couple of dreams about an LDS Hmong girl I know in Appleton. I used to be in our local Hmong branch and still maintain contact with a number of Hmong members, but it had been a couple of months since we had visited her and her family. In one dream, I knocked on a door belonging to a Hmong family and she was the one who opened it and greeted me warmly. I don't recall the other dream except that she was in it. When I awoke, I knew that I needed to visit her. After our three-hour block (1 PM to 4 PM), while driving home, I asked my family if they wouldn't mind stopping at Lee's house on the way home. We had a busy schedule for the evening and taking time at the moment was somewhat inconvenient - it meant they might not have time to eat for a couple more hours - but they were willing (hoping for a brief visit, naturally). We pulled up to her house and I knocked on the door. Interestingly, Lee was the one who opened the door - something that I can't recall happening on past visits. This sweet but very strong 18-year-old girl has been struggling with serious health problems and was near death for several months starting about a year ago, so usually someone else from her large family would open the door. She was excited to see us and told me that it was really strange that we came by today, since she had just had a dream (I believe it was the night before) that she saw me in a midst of missionaries (standing out by virtue of being taller) and was excited to see me again and waved to get my attention. I'm not sure why this visit was so important. We had a good chat and learned of some exciting progress and even of an award her former high school gave her for her example of courage. I think the visit was helpful both for her as well as for my family, but there was no obvious urgent need that was being met that would seem to require a visit that day driven by guidance through divine intervention. Nevertheless, I believe that there was a reason why we needed to be there, if only to help maintain her ties to the Church (her father has left the Church, and she is pretty much the main Latter-day Saint of the family, and still hasn't been able to be at Church for a very long time). I've had a number of other experiences where dreams provided important guidance on issues. It's only about 2% of the time for me that some significant new insight or inspiration comes from dreams, but that small fraction of what I believe to be inspired dreams prove to be very helpful. Related to dreams, sometimes there is just a thought of something important that I must do that is strongly present right before I awake, and those thoughts often prove to be accurate or meaningful when I pursue them. About two months before I was called to be Bishop, I had a dream that I was sitting in the chapel when my boss from my previous job came and sat next to me (Dr. Richard Ellis from my days as an associate professor at the Institute of Paper Science and Technology on the Georgia Tech Campus). He is not LDS, but for dream purposes was a nice choice of a respected authority figure whom I trusted and admired. He leaned over to me and whispered, "You know you're going to be called as Bishop, don't you?" I didn't know, but that dream made me confident that it would happen and helped me get a head start in preparing for that challenging task. Regarding dreams, the scriptures point to many cases where they are a means of providing revelation to members and non-members alike. I think we should be grateful for this divine tool and not overlook the possibility of inspiration or teaching that may be provided in them occasionally. First, habitual mariguana [spelling change mine] smoking can cause potentially serious airway pathology at a relatively early age despite the absence of any clinical or physiologic evidence of disease. Second, regular mariguana use appears to be at least as damaging to the epithelium of the central airways as the smoking of tobacco, despite the far smaller daily number of mariguana joints smoked by mariguana smokers (three to four joints) than the daily number of tobacco cigarettes smoked (>20), suggesting a more damaging effect of mariguana than tobacco per cigarette smoked. Hopefully accurate information about the physical and mental health effects of mariguano (that's my favorite incorrect spelling, suggestive of the kind of contaminants that ruthless drug dealers might add as filler) will help us weed out the myth that it's harmless. LDSDiabetics.com is a valuable new site by David Olsen that provides resources and a discussion group for LDS people and those of all faiths struggling with the spiritual, mental, and physical aspects of diabetes. David's work can also be of value to those struggling with mental illness in general. Let me know what you think. Matthew 19: Can You Explain This Away? In Matthew 19:16-21, a man approaches Christ and asks "What good thing shall I do, that I may have eternal life?" Quiz time! Which of the following was Christ's answer? "Thou cultist! Knowest thou not that there is nothing one must do to be saved, for salvation cometh by faith alone." "If thou wilt enter into life, just believe. But if thou believest thou must keep the commandments, thou shalt be cast into hell with the Mormons." "If thou wilt enter into life, keep the commandments." There are several other places in the New Testament where Christ gives similar teachings, but Matthew 19 is especially interesting. Those who claim that we are a cult because we believe in seeking to follow Christ in word and deed really puzzle me. If the Bible has more for us than just one verse (such as Ephesians 2:8), what are we to make of the frequently repeated plea of God for man to keep His commandments? I've had some Protestants try to explain that Christ was being ironic, and that He was deliberately trying to mock the idea of keeping the commandments in this case. Please! Latter-day Saints, this is a useful scripture when teaching those with sincere questions - but don't waste your time arguing over this or any other verse with those who just want to argue and refuse to listen. Some related passages include Luke 10:23-28, Mark 12:28-34, Mark 10:17-22, and many more, including many from Paul (yes, Paul - such as 1 Tim. 4:16). John Tvedtnes has a great article in Meridian Magazine, "Idolatry in the Book of Mormon." An interesting point is that the rise of idolatry among the Nephites, Lamanites, and Jaredites is likely due to the influence of neighboring peoples who were already into idol worship, as was the case for the Israelites in the Old Testament.